The Rock A design is one of the most unique setups in FTL - and unfortunately, not in a good way. This is the only ship that starts with missiles as its sole form of attack, in the form of the Artemis Missile and the Hull Missile. Let's cover the advantages of this setup first before moving on to the drawbacks. 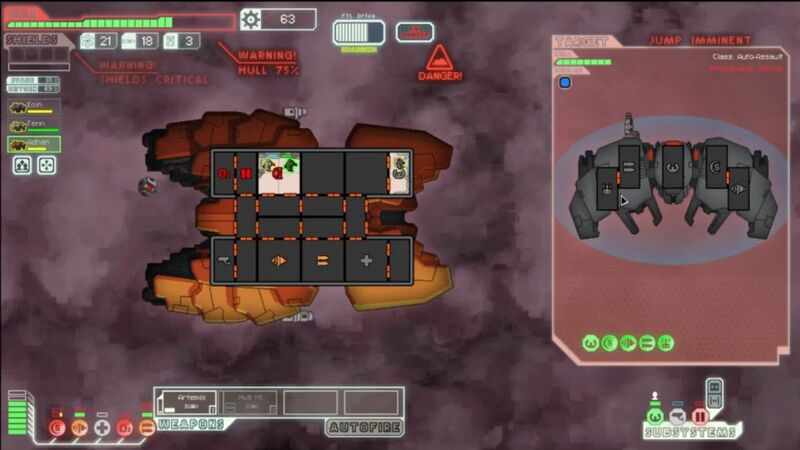 The one edge of an all-missiles design is that the player can ignore enemy shields completely. That's a very weird feeling, and something that only pure boarding ships using a Teleporter also get to enjoy. (In fact, the starting missiles on the Rock A setup make for good complements to an invasion strategy, assuming of course that you can buy a Teleporter system in a store. Rock A does not start with one.) This ship does get to begin with the Artemis Missile, in the running for the game's best missile system. It has a short chargeup time and deals 2 damage for one weapon power - there's a lot to like here. The Hull Missile is a significantly weaker weapon, but it does deal double damage when fired against an empty portion of the enemy hull (4 damage instead of 2 damage). Very useful for cutting through ship hulls once their weapons have been disabled. Intelligent use of the Hull Missile will help keep the missile stash going for a little bit longer by cutting down on the total number of shots needed to kill the enemy. Other advantages of this ship are pretty scarce. It does start with Rock Plating, which can be sold for a nice payout of 40 scrap at the first store encountered. On the higher difficulties, I strongly encourage doing this to help get out in front of The Curve. The crew of three Rockmen on this ship can be nice as well, especially for someone planning to get a Teleporter. Everything else is very average, not too much different from the default Kestrel. Unlike some of the other designs, the Rock A does provide a decent blank template to build off of, once the starting weapons are removed. The good news is that the missiles on the Rock A sell for decent value, especially the Hull Missile. If the player throws in the Rock Plating for sale, there's about 100 scrap available to spend at the first store visited. This is where the Rock A often proves to be so frustrating: your fate is tied to the stuff found along the way or listed for sale at stores. I had runs on stream where the first three stores that I visited with the Rock A had nothing but more missiles for sale! Very amusing but not terribly helpful. The result is the the Rock A proves to be one of the most RNG-dependent ships in the game. Better hope you find or can buy something useful, because you have about two sectors before all the missiles are gone and your game is lost. And even if you do, you're still spending your minimal early game funds on changing out the weapons, rather than upgrading shields, engines, etc. The Rock A design puts the player into a deep hole that requires skill and/or luck to climb out of. 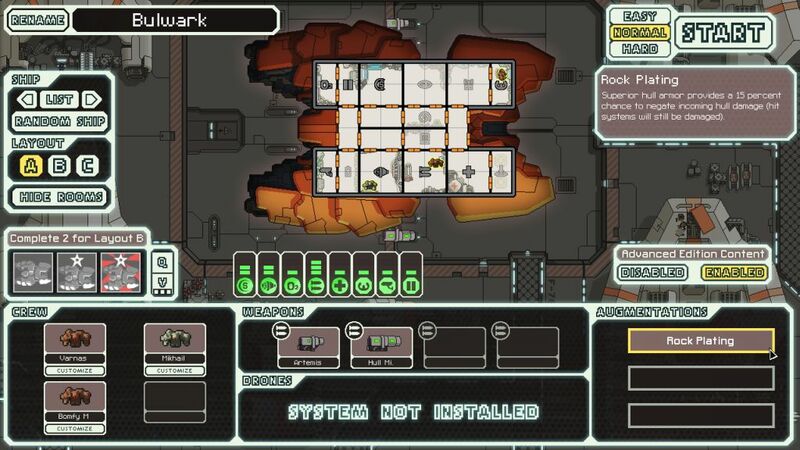 This is easily one of the weakest ships in FTL, coming in fifth from the bottom on my tier list. Only the truly decrepit designs are worse off than this one. I lost several previous runs on stream before achieving victory. Most of these were due to poor luck with stores, times where I managed to save plenty of scrap from encounters and simply couldn't find anything good to purchase. On one of those occasions, I picked up a Teleporter due to lack of other options, and then managed to botch the invasion gameplay by losing a pair of Rockmen to an autoscout. That was effectively the end of that run, as I had no weapons and had been planning to rely on boarders for offense. During the run linked above at the top of this page, I had some nice luck early on, picking up a few easy battles and a sellable augment (Stealth Weapons) in a random postbattle drop. Even with good luck, you'll still have to deal with missiles failing to hit their targets at times. I missed three straight shots in the battle pictured above - very painful when the ammunition count keeps dropping with each shot - and against a ship more dangerous than the one in this encounter, that could have been disastrous. But then they offered the Scrap Recovery Arm in their surrender, and yeah, we were happy to take that. 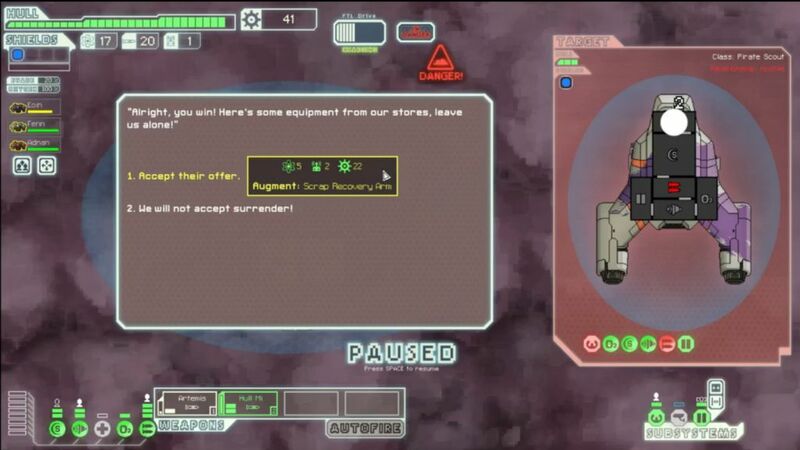 This was a gigantic break of good luck, and having it appear in Sector One, for free, was simply ridiculous. Few things will do more to put you out in front of The Curve than a early Scrap Recovery Arm obtained at no cost. 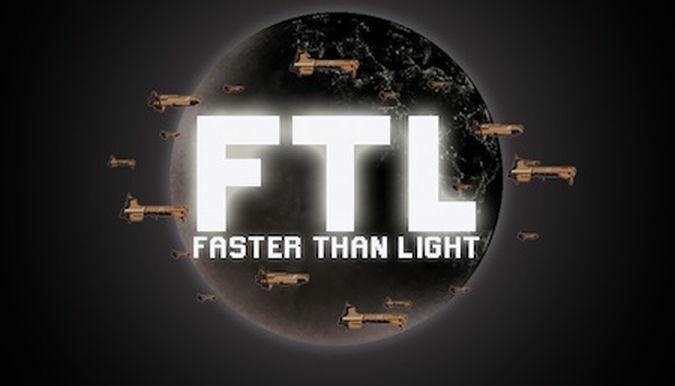 The very next battle showed the ugly side of FTL's randomness. I was facing an autoscout with a Combat I drone and a Heavy Laser that was also trying to run away from the fight. The Combat Drone kept my one shield bubble offline, allowing the Heavy Laser shots to crash home. To make matters worse, the first Artemis Missile failed to hit the autoscout, while the first Heavy Laser shot hit my Weapons system for 2 damage. No more Hull Missile. Then the second Heavy Laser shot crashed into my Shield unit, taking that offline as well. No shields against a Combat Drone and Heavy Laser? Ummm... not good! Thankfully the autoscout was indeed running from this battle, or I might well have died here. It jumped away after smacking around my defenseless hull a bit further. The doubled rebel fleet pursuit was a small price to pay to escape from this fiasco. 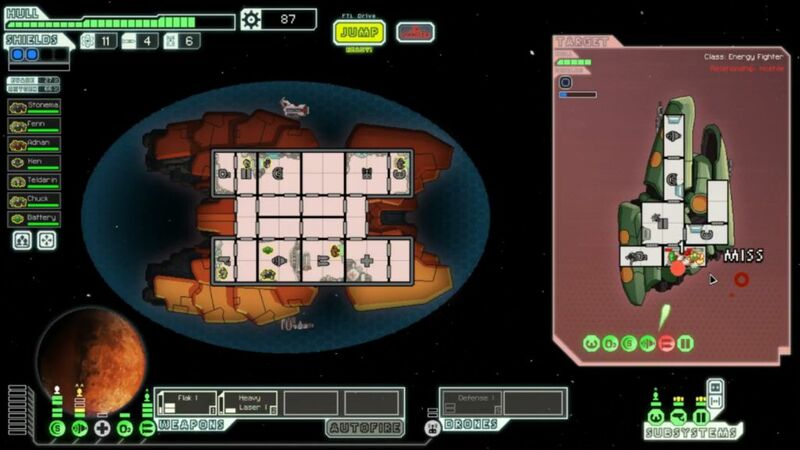 I picked up a Human crewmember in one of the following battles while continuing to accumulate scrap. Over 100 now and still going. There was a store at the bottom end of Sector One, in a spot where I'd likely have to face the rebels if I headed there. I opted for that choice, given the need to get new weapons ASAP. (Down to only 9 missiles remaining, eep!) However, the store did a fine job of trolling me by having only missiles and bombs for sale... I did pick up a Drone Control + Defensive Drone combo, paying for it by selling Stealth Weapons and Rock Plating. This was far from what I'd been looking for, sadly. With a Scrap Recovery Arm in hand and a solid weapon pair in the Flak + Artemis combo, the game suddenly became much easier. I kept finding more crew in events, getting an Engi, a Zoltan, and a fourth Rockman. I had 7 crew halfway through the second sector! I traded the Artemis at the next store for a Heavy Laser I, and the Flak + Heavy Laser combo abolutely wrecked the early sectors of the game. At this point, the run became fairly routine, and I'll hold off on writing up the rest of it. Feel free to go watch at the links above, I think it's still very much a fun ride. 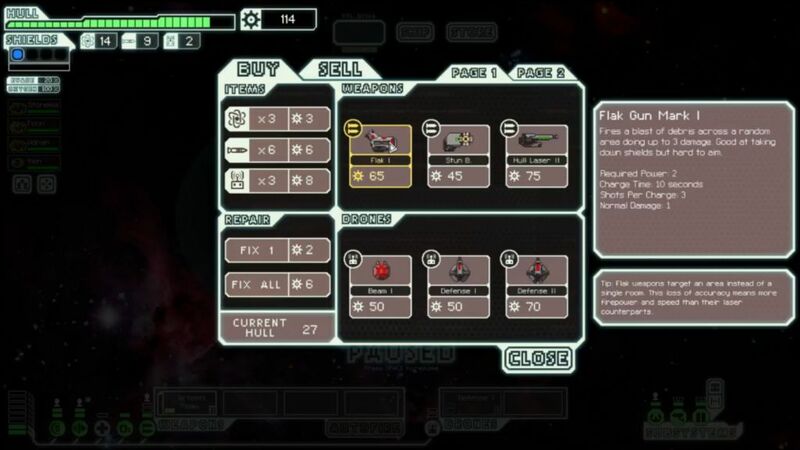 But by now, you probably don't need me to describe how to win once I've managed to get my hands on strong weapons, a full crew, and an economic bonus augment like the Scrap Recovery Arm. Thanks for reading! May you have better luck than those poor Zoltans on that ship above.